What is it? An open-world sailing RPG in a procurally generated world. After my first two hours with Windward, the open-world sailing RPG from Tasharen Entertainment, I had a single thought in my head: is this all there is? After four more hours, I had another thought: if this is all there is, why the hell can't I stop playing it? I'm of two minds about nearly every aspect of Windward. I love games I can pick up quickly, and Windward definitely fits that bill. Within a few minutes of playing you'll have entirely grasped the basics of the game. Engage in ship-to-ship combat with pirates and enemy factions, capture towns, sentry posts, and lighthouses (or build your own), turn a profit by transporting cargo or passengers from one port to another, and use those profits to upgrade your ship and crew or buy a bigger, better ship. Sailing is a snap, using either WASD or the mouse, and the space bar to drop anchor. Wind isn't much of a concern: it helps you reach top speed when it's blowing in your favor, but even when it's not you'll keep moving right along. Thing is, there's really not much beyond those basics. Every town you visit will have a handful of missions, but these missions are nearly always the same and you'll wind up doing them dozens of times over. 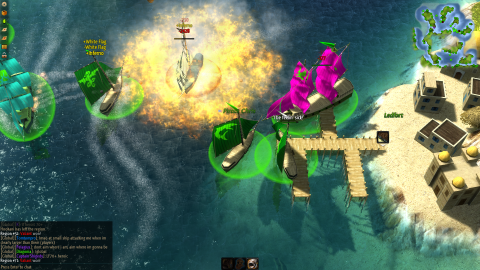 In combat, your gunners auto-fire while you and your enemy circle each other, and if you've unlocked special attacks you can use them to shred sails, entangle rigging, or set ships on fire with barrels of flaming grog. Despite dozens of victories and a number of losses, however, I have no memorable stories to tell. One battle feels like the next, and capturing towns only requires bombarding sentry towers and then parking offshore. With simple systems, repetitive tasks, and incremental rewards, Windward feels like a grind from almost the moment you set sail. Who wants to check out that shipwreck? I'm sure the sharks are friendly. None of that really explains why I can't seem to stop playing it. I can't even really explain it, other than that there's is a sort of enjoyable mindlessness to Windward, a soothing and relaxing routine that I can settle into, letting the hours drift by while my ship carves a familiar path through the sea. Slowly chipping away at enemy territory until you've conquered a new section of the grid is satisfying, and the occasional worthwhile stash of booty found in the open sea can be exciting, but most of what I like is that it's a small series of activities that don't require a lot of effort. It certainly doesn't hurt that Windward provides a beautiful little procedurally generated world to spend time in. The sun shimmers off the waves, wisps of clouds drift by overhead, barely visible shipwrecks lurk beneath the water, seagulls and sharks circle your ship, and friendly AI captains shout greetings or offer tips on where best to buy and sell goods. The physics are fun: while attacking land-based towers it's neat to watch your teeny cannonballs roll and rebound against the rocks, and explosions, while tiny, are still glorious. The music and sound effects are great, and the menus and UI are simple to understand and unobtrusive. I guess the question is: how simple is too simple? I do appreciate games that don't require the endless scouring of wikis and a doctorate from Minmax University, but it's still hard for me not to wish for a little something deeper in virtually every aspect of Windward. A bit more of a reward for exploration, more interesting features in the worlds you can generate, perhaps a few more options for ship management and a shade more depth to the economy. Even multiplayer didn't feel appreciably different than single-player, there were just more ships sailing around (and a fair bit of lag). Windward is a wonderful setting and worthy framework for a game, but while the ocean is beautiful there isn't much beneath the surface. I knew pirates had salty language, but that's way out of line. You can recruit AI followers to help you in combat. Shipwrecks in front of a lighthouse? Not a great advertisement for lighthouses. I have one million pictures of ships exploding, but no real stories to go with them. Multiplayer gives you considerably more allies to pal around with.